The third installment of The Western Lights series returns to the Dickensian atmosphere of Dark Sleeper (though the gruesome fates of the pretty young counter-ladies at Arifay’s oyster bar reminds the reader of the Lovecraftian dangers lurking beneath the surface). The novel is actually two stories whose resolutions occur in the decaying cathedral town of Nantle but are otherwise quite separate. There’s the story of Frederick Cargo of the town of Cargo, whose grandfather has left a quarter of his fortune to an unknown named Jerry Squailes of Nantle. Fred’s grandfather’s lawyer, Mr. Liffey, who harbors his own secrets, and his wife Lucy and her companion travel to Nantle to find out who this Squailes is and (if Lucy has her way) find a means to annul the will. By fate, their fellow passenger on the sea voyage to the cathedral town is the tormented Jane Wastefield. Her soul is coveted by the ancient Minoan god Poteidan (Poseidon) and she is pursued by his devilish “sons,” the Triametes. The latter tale is far darker in tone and its ending is, at best, ambiguous. The former is much lighter and, though there is a vengeful spirit, doesn’t approach Miss Wastefield’s in terror or despair. Some might complain at the juxtaposition of two such dissimilar stories but it worked for me. If you’ve read and enjoyed Barlough’s first two novels in the series, you should enjoy this one. If you’re new to Barlough, I’d counsel reading Dark Sleeper or The House in the High Wood first. Though, they’re all standalone novels, Dark Sleeper is a better introduction to this world, and The House in the High Wood is the more focused and powerful story. 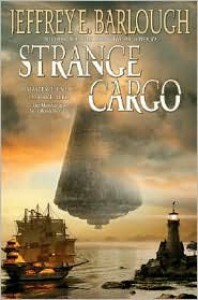 If you’re “stuck,” though, with just Strange Cargo, you’ll still enjoy yourself.